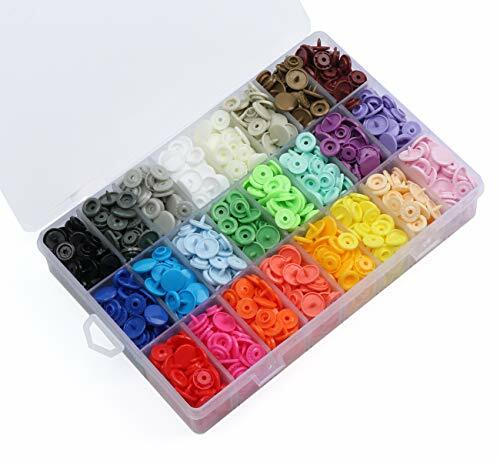 Great value snap button kit: 408 complete sets in 24 rainbow colors, 17 sets per color. 1 set = 2 caps + 1 socket/female + 1 stud/male. There are 34 caps, 17 sockets, 17 studs per color. Size: 12mm (1/2 inch cap diameter). Compatible with KAM or Babyville pliers (Not Included). Perfect rust-free alternative to metal snaps and a no-sew alternative to regular sew-on buttons. Widely used in clothing, cloth baby diapers, bibs, towels, and other embroidery, craft, sewing and household DIY projects. Easy to use and storage: Prepare a snap plier firstly and get the snaps lined up it only takes a few seconds to install. Machine washable and dryable. Coming with a high quality organizer storage case, each color in a single compartment, no mix up. Satisfaction gurantee: We offer 30 days money back warranty and lifetime replacement. If you are not 100% satisfied, feel free to contact us.